South Coast Plaza celebrates its 50th anniversary this year, looking back on five decades of rich history and an impressive collection of high-end stores. A year before the San Diego freeway reached Costa Mesa, on the site of a former lima bean farm, South Coast Plaza opened in March 1967 with May Co. and Sears as its major department stores. Over time, SCP has grown into a luxury shopping center with designer boutiques like Gucci and Louis Vuitton welcoming visitors from across the region and around the globe. The mall is one of the largest on the West Coast with more than 250 stores and restaurants on 128 acres. 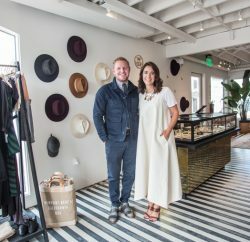 And, with sales approaching $2 billion per year, it’s billed as “the most successful planned retail destination in North America.” Aside from boosting the economy, the center has also developed philanthropic partnerships and played a major role in elevating Orange County’s fashion scene. Now celebrating its 50th anniversary, SCP plans a lineup of special events and exclusive products: Runway fashion shows will spotlight the latest looks by top designers this fall and the center is collaborating with high-end brands including Gucci, Marni, Brunello Cucinelli and Tod’s to produce limited-edition items. Meanwhile, luxury book publisher Assouline will present an anniversary release focused on South Coast Plaza’s heritage, illustrating the center’s evolution with never-before-seen photographs. And, a commemorative exhibit will highlight the center’s history. South Coast Plaza stands on property that was part of the substantial agricultural complex owned by the Segerstrom family in the early to mid-20th century. Henry Segerstrom, who would go on to provide the land for the Segerstrom Center for the Arts, was one of the main players in the transition from cultivating beans to enhancing culture in Orange County. Segerstrom has an impressive backstory, enlisting in the military following the attack on Pearl Harbor only to be injured and awarded the Purple Heart for his service in the Battle of the Bulge. Upon returning to California, Segerstrom earned both bachelor’s and master’s degrees from the prestigious Stanford University before taking his family’s company, C.J. Segerstrom & Sons, in a new direction: commercial real estate. 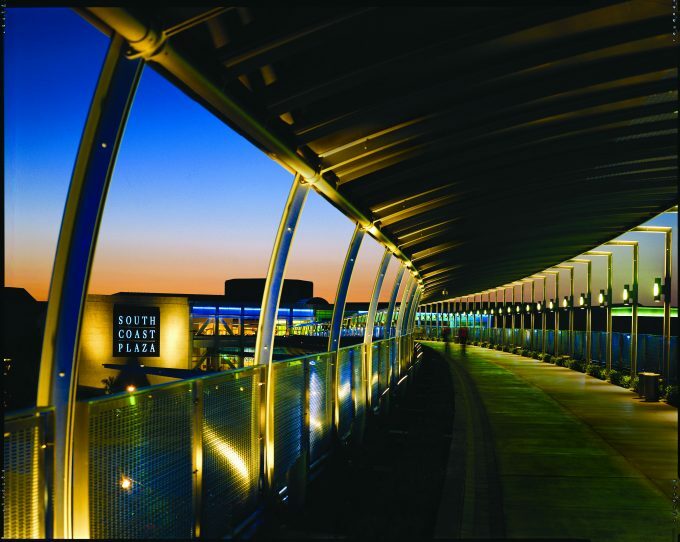 Although South Coast Plaza wasn’t the firm’s first project, it was the one that propelled the company to success. Planning began in 1962, around the same time that the San Diego freeway was being designed. Because the area was largely agricultural, Segerstrom knew it was important to build near a direct route that would allow shoppers to reach the proposed mall—and the 405 freeway would ensure just that. Irvine-based architectural historian Alan Hess says that nearby Fashion Island was being developed around the same time, but that its seaside site was less ideal for drawing visitors than South Coast Plaza, positioned in a central location that could be reached from all sides. Once the logistics were worked out, C.J. Segerstrom & Sons settled on Los Angeles-based Victor Gruen Associates to design the shopping center. Initial development was based around the idea that the mall would likely expand on a large scale, so removable panels were incorporated—making it easier than ever when they did, in fact, extend the building. “The thing I find fascinating about South Coast Plaza is how the architects have expanded and added on and found space for even more retail,” Hess says. SCP officially opened in 1967 with 70 shops, but its continued success lies in the luxury boutiques that Segerstrom incorporated through the years. He began reaching out to upscale designers around the world, an unprecedented move at the time. A decade after the mall opened, Segerstrom invested in Yves Saint Laurent, Halston and André Courrèges in order to bring them to South Coast Plaza. They were the mall’s first high-end boutiques, but, shortly after, designers like Dior, Gucci, Hermès and Louis Vuitton followed suit. As additions continued, with entrances on various sides, interior roads connecting parking lots and multiple parking structures, the development of South Coast Plaza was among the first of its kind, creating a unique type of mall-centric downtown environment, according to Hess. “South Coast Plaza and Fashion Island are both examples of how OC pioneered these types of suburban cities,” Hess says. Although Segerstrom, a longtime resident of Newport Beach, died in 2015, SCP is part of his lasting legacy. South Coast Plaza has undergone many evolutions through the years and Sears is the only original anchor store that remains: Macy’s, Bloomingdale’s, Saks Fifth Avenue and Nordstrom (the first one to open outside of the Pacific Northwest) now accompany the classic department store in addition to smaller shops. Notably, there are few places in the world where shoppers can stroll past a Giorgio Armani boutique and a Bath & Body Works shop in the same complex, but that’s part of what makes South Coast Plaza unique. The mall expertly blends high-end designer stores with more casual retail spots to create a one-of-a-kind experience. “Unlike other malls, South Coast Plaza is an all-in-one shopping destination that not only caters to label lovers, but also [to] those who might be on a budget,” Christen says. Of course, it’s boutiques like Chanel, Balenciaga, Versace, Burberry, Michael Kors, Dolce&Gabbana, Valentino and Oscar de la Renta that get the most attention. SCP is known for securing the first U.S. locations and flagships for many brands. In recent months, the center landed the only Weekend Max Mara store in North America, as well as The Webster’s first West Coast boutique and Les Parfums Louis Vuitton’s only U.S. site. Coups like these help set SCP apart from the traditional mall setting; items carried in these upscale shops aren’t found in many other places in Southern California. Christen says SCP has been invaluable to her as a stylist. Having established relationships with various vendors, she’s able to pull pieces or entire outfits for clients, get clothes delivered to her door, have runaway items specially ordered or create luxury shopping experiences for clients with the help of the center’s VIP lounge. It doesn’t end with clothing though. The massive complex is also home to a variety of high-end accessory boutiques, including famed watchmakers IWC Schaffhausen, A. Lange & Söhne and Jaeger-LeCoultre as well as luxury jewelers Cartier, Harry Winston, Tiffany & Co. and Bulgari. The heavy concentration of designer boutiques makes South Coast Plaza what it is, but beyond fashion brands, the center also holds a trove of other upscale stores. Teavana, Papyrus, L’Occitane En Provence, the Apple Store, Crabtree & Evelyn, Assouline, Aveda, Pottery Barn and bareMinerals can all be found within its walls. 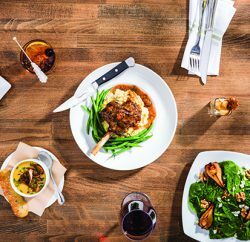 While strolling through halls filled with so many retail stores is every shopper’s dream, foodies have a home at the mall as well. SCP has become a hot spot for innovative and critically acclaimed restaurants: From sweet shops like Godiva and Sugarfina to the Asian fusion establishment AnQi, there is something for every palate. 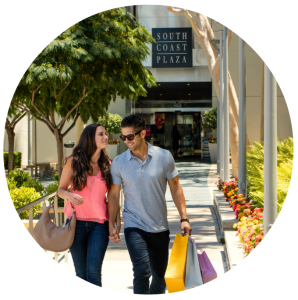 With so much to offer shoppers, South Coast Plaza has become a shopping destination in and of itself, drawing visitors from around the world each year. While travelers from Canada and Mexico make the short trek, shoppers from Japan, China and the Middle East also flock to Costa Mesa to shop at this luxury retail mecca. While the shopping complex hasn’t announced any official plans to expand further, the interior is always evolving with new stores replacing some of the old. Last fall, American luxury brand Cole Haan opened a retail location at South Coast Plaza, marking the company’s first West Coast location featuring the new residential concept: Designed to look like a home, the store sells clothing, shoes, handbags and more. This year will see the addition of other names like Dior Homme, Stella McCartney, Aquazzura and more. Much like the past, the future of South Coast Plaza lies in its high-end boutiques. But the legacy of the center includes much more than shopping. It is home to a variety of events each year, including runway shows, special sales and philanthropic gatherings. SCP has been a longtime supporter of the arts, for example, donating land and hosting fundraisers for South Coast Repertory, Segerstrom Center for the Arts and the Orange County Museum of Art. The shopping destination also supports organizations like Big Brothers Big Sisters of Orange County and Friends of CASA (Court Appointed Special Advocates), while many of the mall’s boutiques partner with nonprofits for cocktail parties and in-store specials that benefit various causes. “Their dedication to helping Second Harvest in its mission to end hunger, along with their support of many other local charities, has made Orange County a better place for all who live here,” Suydam says. As SCP celebrates five decades of community involvement, as well as shopping and dining excellence, it’s clear that the opulent center will continue to shine in the sartorial world and beyond. Shopping at South Coast Plaza is a one-of-a-kind experience. Along with boutique designer shops, complimentary Wi-Fi and an invitation-only VIP lounge, the center offers a variety of special services. Those interested in a curated experience at South Coast Plaza can make an appointment with a personal shopper. Employed by the center, these stylists are experts in all things fashion. With 24-hour advance notice, they will help shoppers look their best, helping them assemble a whole new wardrobe or navigate the season’s hottest trends. While most malls have an information counter, few have the bespoke services offered at SCP’s concierge desks. These concierges do perform standard tasks like providing strollers and wheelchairs (a deposit is required), gift certificate sales and restaurant reservations, but they also go above and beyond. If your bags become too much to handle, there is a complimentary package check at each of the four concierge locations throughout the mall. Guests can also visit the concierge desk for translation assistance, with bilingual representatives fluent in more than 40 languages.